Atmospheric chemistry involves study of the chemistry of the atmospheres of Earth and other planets. It is a branch of atmospheric science and is a multidisciplinary field of research, drawing on environmental chemistry, meteorology, physics, computer modeling, oceanoraphy, geology, volcanology, and other disciplines. In addition, it is being increasingly associated with the field known as climatology. Earth's atmosphere is composed of about 78 percent nitrogen, 21 percent oxygen, and small amounts of water vapor, carbon dioxide, argon, and other gases. This mixture of gases, commonly called air, protects and sustains life on Earth in a variety of ways. It provides oxygen for respiration, carbon dioxide for photosynthesis, and water vapor for the precipitation that replenishes moisture in the soil. In addition, carbon dioxide and water vapor act as "greenhouse gases" that keep the Earth sufficiently warm to maintain life. Nitrogen is used by "nitrogen-fixing" bacteria to produce compounds that are useful for plant growth. Water vapor prevents exposed living tissue from drying up. Ozone in the stratosphere absorbs ultraviolet solar radiation that could damage living tissue. In addition, higher layers of the atmosphere protect the Earth from bombardment by meteorites and charged particles in the solar wind. The composition of Earth's atmosphere has been altered by human activities such as fuel burning and industrial production, and a number of these changes are harmful to human health, crops, and ecosystems. Examples of problems that involve studies in atmospheric chemistry include acid rain, photochemical smog, and global warming. Researchers in the field of atmospheric chemistry seek to understand the causes of these problems and to look for possible solutions. They help inform and evaluate government policies that are related to the environment. The ancient Greeks regarded air as one of the four elements. However, the first scientific studies of atmospheric composition began in the eighteenth century. Chemists such as Joseph Priestley, Antoine Lavoisier, and Henry Cavendish made the first measurements of the composition of the atmosphere. In the late nineteenth and early twentieth centuries, interest shifted towards trace constituents at very low concentrations. One particularly important discovery for atmospheric chemistry was the discovery of ozone by Christian Friedrich Schoenbein in 1840. In the twentieth century, atmospheric science moved on from studying the composition of air to a consideration of how the concentrations of trace gases in the atmosphere have changed over time and the chemical processes that create and destroy compounds in the air. Two particularly important examples of this were the explanation of how the ozone layer is created and maintained by Sydney Chapman and Gordon Dobson, and the explanation of photochemical smog by Haagen-Smit. In the twenty-first century, the focus is shifting once again. Atmospheric chemistry is increasingly studied as an important component of the Earth system. Instead of concentrating on atmospheric chemistry in isolation, the focus is now on seeing it as one part of a single system with the rest of the atmosphere, biosphere, and geosphere. An especially important driver for this is the links between chemistry and climate, such as the effects of changing climate on the recovery of the ozone hole and vice versa but also interaction of the composition of the atmosphere with the oceans and terrestrial ecosystems. The concentration of CO2 and CH4 vary by season and location. ppmv represents parts per million by volume. Observations, laboratory measurements, and modeling are the three central elements of atmospheric chemistry. Progress in this field is often driven by interactions between these components and they form an integrated whole. For example, observations may tell us that more of a chemical compound exists than previously thought possible. This would stimulate new modeling and laboratory studies, which would increase our scientific understanding to a point where the observations can be explained. Observations are essential to our understanding of atmospheric chemistry. Routine observations of chemical composition provide information about changes in atmospheric composition over time. One important example of this is the Keeling Curve—a series of measurements from 1958 to today—that show a steady rise in the concentration of carbon dioxide. These types of observations are conducted in observatories, such as that on Mauna Loa, and on mobile platforms such as aircraft (for instance, the UK's Facility for Airborne Atmospheric Measurements), ships, and balloons. Observations of atmospheric composition are increasingly made by satellites with important instruments, such as GOME and MOPITT, giving a global picture of air pollution and chemistry. Surface observations provide long-term records at high resolution in terms of time, but they are limited in the vertical and horizontal space they provide observations from. Some surface-based instruments, such as LIDAR, can provide concentration profiles of chemical compounds and aerosols, but they are restricted in the horizontal region they can cover. Many observations are available online in Atmospheric Chemistry Observational Databases. Measurements made in the laboratory are essential to our understanding of the sources and sinks of pollutants and naturally occurring compounds. Lab studies tell us which gases react with one another and how fast they react. Measurements of interest include reactions in the gas phase, on surfaces, and in water. Of additional significance is photochemistry, which quantifies how quickly molecules are split apart by sunlight and the types of products formed, plus thermodynamic data such as Henry's law coefficients. 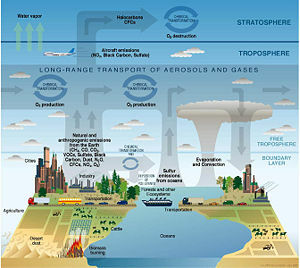 To synthesize and test the theoretical understanding of atmospheric chemistry, computer models are constructed. Numerical models solve the differential equations governing the concentrations of chemicals in the atmosphere. They can range from simple to highly complex. One common trade-off in numerical models is between the number of chemical compounds and chemical reactions modeled versus the representation of transport and mixing in the atmosphere. For example, a box model might include hundreds or even thousands of chemical reactions but will only have a very crude representation of mixing in the atmosphere. By contrast, 3D models represent many of the physical processes of the atmosphere but due to constraints on computer resources will have far fewer chemical reactions and compounds. Models can be used to interpret observations, test understanding of chemical reactions, and predict future concentrations of chemical compounds in the atmosphere. One important current trend is for atmospheric chemistry modules to become one part of Earth system models in which the links between climate, atmospheric composition, and the biosphere can be studied. Some models are constructed by automatic code generators. In this approach, a set of constituents are chosen and the automatic code generator then selects the reactions involving those constituents from a set of reaction databases. Once the reactions have been chosen, the ordinary differential equations (ODE) that describe the changes over time can be automatically constructed. ↑ NASA, NASA. Retrieved April 28, 2008. Brasseur, Guy P., John J. Orlando, and Geoffrey S. Tyndall. 1999. Atmospheric Chemistry and Global Change. Oxford, UK: Oxford University Press. ISBN 0195105214. Finlayson-Pitts, Barbara J., and James N. Pitts, Jr. 2000. Chemistry of the Upper and Lower Atmosphere: Theory, Experiments, and Applications. San Diego: Academic Press. ISBN 012257060X. Seinfeld, John H., and Spyros N. Pandis. 2006. Atmospheric Chemistry and Physics: From Air Pollution to Climate Change. 2nd ed. New York: Wiley. ISBN 0471828572. Warneck, Peter. 2000. Chemistry of the Natural Atmosphere. 2nd ed. San Diego: Academic Press. ISBN 0127356320. Wayne, Richard P. 2000. Chemistry of Atmospheres. 3rd ed. Oxford, UK: Oxford University Press. ISBN 019850375X. Paul Crutzen Interview – Vega Science Trust. This page was last modified on 27 April 2016, at 16:52.